Snow chains for a lifetime! Guaranteed Quality - Made in Italy! 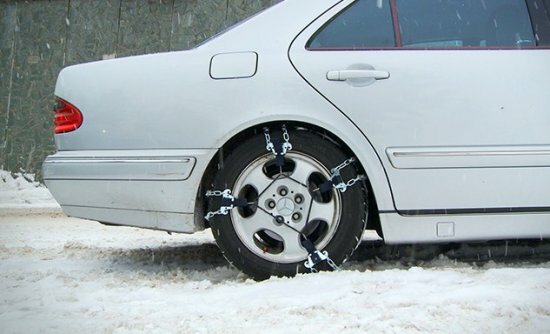 Don’t waste money on bad and cheap chains which are difficult to install and crumbling, get Safe To Go premium snow chains which are easy and quick to install, have a nylon coating behind the ram head-shaped buckle - protection from scratches for alloy wheels, and security steel buckles that guarantee a comfortable and safe driving in winter conditions - on snow, ice and mud! 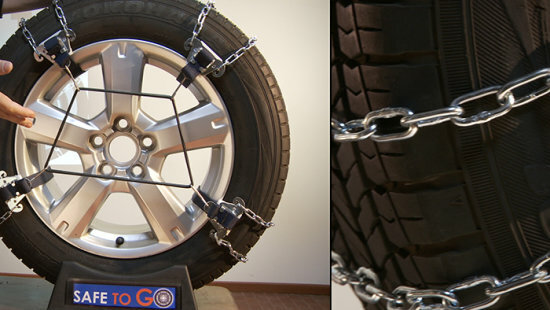 SAFE TO GO – FOR ONLY 5 MINUTES ON ANY VEHICLE AND TIRES UP TO 205! 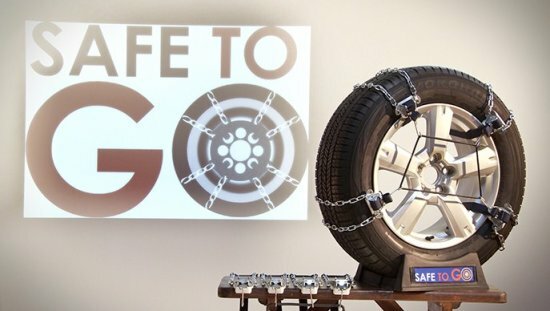 Safe To Go has been designed to be mounted on the drive wheels in just 5 minutes - anyone will be able to mount the device on their car in an instant, from the expert driver to the novice! 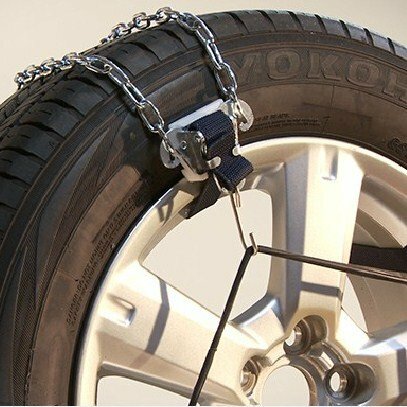 It is suitable for any kind of vehicle and tires up to 205, it is safe like the best snow chains on the market, buy it is way cheaper and it makes your trip more comfortable and safer. This system has been designed and manufactured entirely in Italy, it’s 100% safe and patented. Plus, thanks to the nylon coating behind the ram head-shaped buckle, you won’t get damages to the tire tread and aluminum rims! The secret of Safe To Go is this ram head-shaped, zinced steel buckle that allows the device to stay still on the tire without damaging it, plus it has a special, ultra-compact, cloth part that prevents the band from unfastening. That guarantee durability and resistance to the weight of any vehicle, from economy cars to commercial vehicles. Once you make the band pass through the holes of the rim, fixing it to the tire is a snap. Just make the band pass through the right space and close the safety buckle. 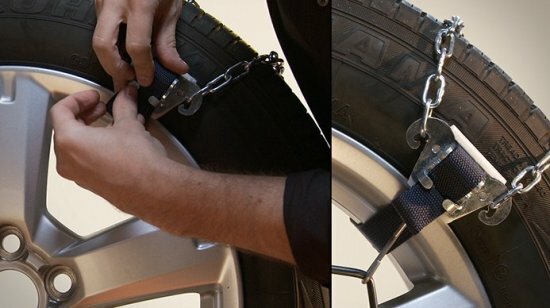 After this step, you just need to make the band pass through the hole in the opposite way, so that the safety buckle won’t ever unhook from the tire. 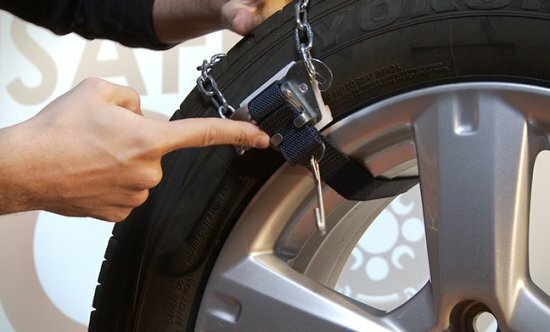 The last step is to hook the elastic safety band to the little hooks included in the set, so that the system is even tighter and completely attached to the tire tread. 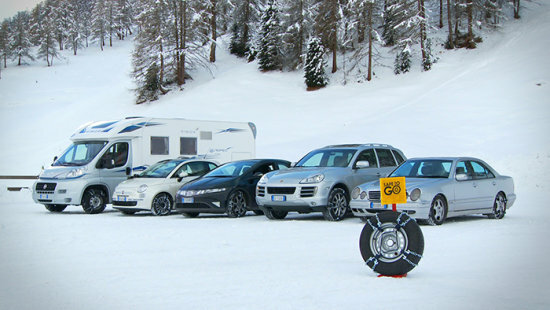 No matter what kind of vehicle you have, Safe To Go fits all types of tires up to 205 and on all vehicles: cars, vans, commercial vehicles, campers… a car with special tires or if it’s not possible to use regular snow chains. 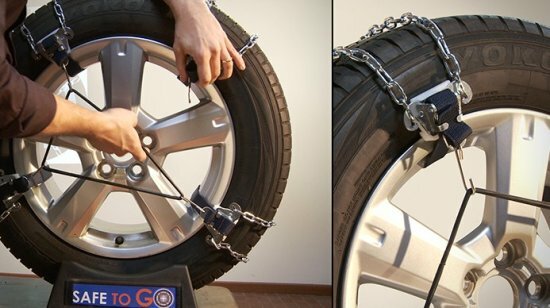 You no longer have to buy special snow chains for one car, second for other car ... now you have one set of chains of superior quality that fits all types of vehicles! You won’t be stranded anymore waiting for the emergency service! And you don’t have to stay at home because it’s too dangerous to go outside due to unexpected freezing temperatures!